The Days of Johann, an agility dog! : Black and White Sunday: Just chillin'! Black and White Sunday: Just chillin'! After days of super cold weather at our cabin, we are looking forward to nice days ahead, when we can just chill in the sun! You sure look happy and cozy there! 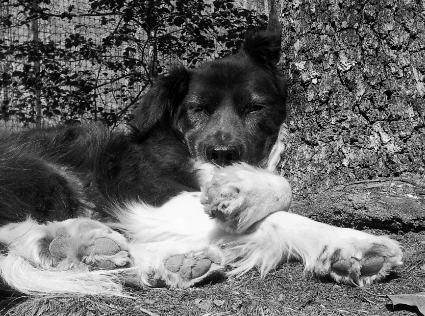 To a dog, even a tree can be a pillow. You look so comfy! What a perfect way to spend a Sunday. Love it Leslie. Great pic.